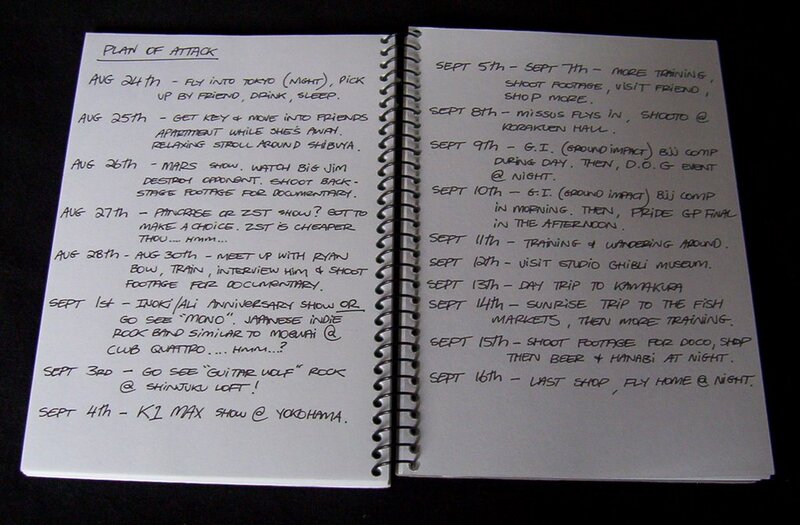 So above is the plan of attack for the forth coming documentary filming trip to Tokyo. I'm just 3 weeks out before I leave and the count down has begun. Camera's ready, gear ready to go, now just playing the waiting game. What's this documentary I talk of? Well the impending trip is to film a sequel as such to my last doco, MMA Japan, and will be about an insiders view on the MMA scene in Tokyo. I plan to film at some top gyms, both training and interview footage, film at some shows ie SHOOTO, Pancrase etc, secrets to MMA shopping and to show how to get the most out of your trip to Tokyo MMA wise. Well..we'll see how it goes..
seems my computer is remembering my bro's blogger ID, lucky coz I can't seem to email out from this server. ok, I have an adsl connection so it's just plug in and go when you get to my place in tokyo. love the new blog. onya mate.